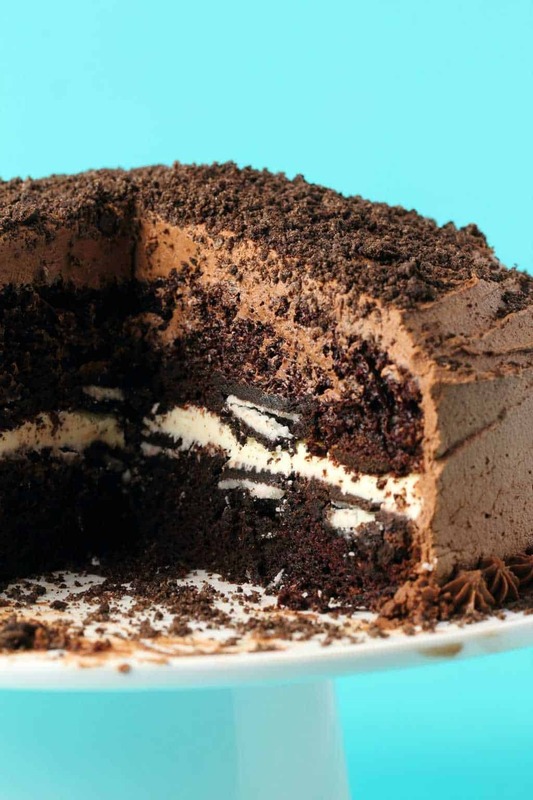 This vegan oreo cake looks like a giant oreo cookie! 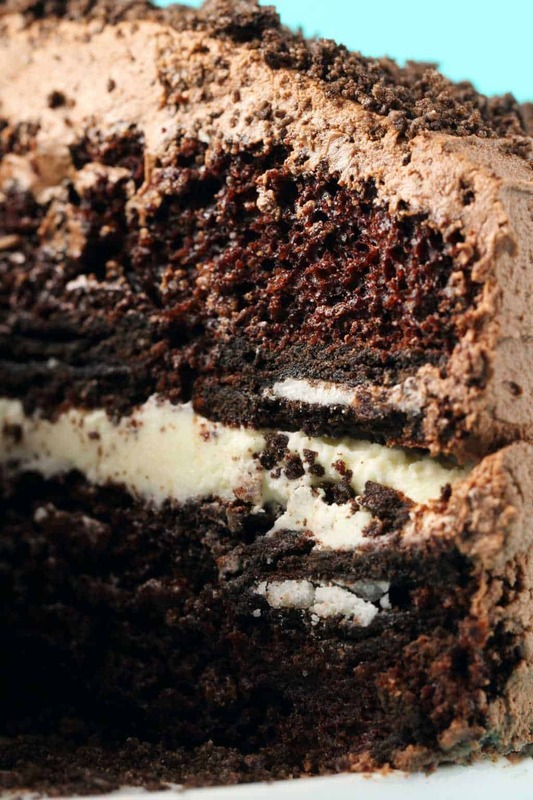 Oreo cookies are baked into the chocolate cake layers and it has a vanilla center and chocolate frosting. So this vegan oreo cake actually looks like a giant oreo. 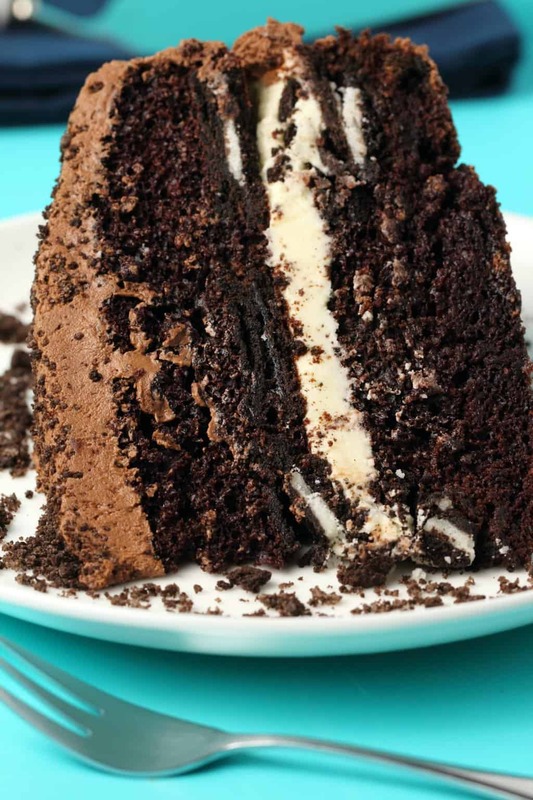 Not only is it made with loads of actual oreo cookies baked into the layers but the cake itself looks like a big oreo, with white vanilla frosting sitting between two layers of chocolate cake. It’s loads of fun to make and definitely one you’ll enjoy making for the oreo lovers you know. So how do you make a vegan oreo cake? It’s easier than you can imagine. 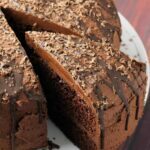 It’s a simple chocolate cake recipe adapted from our classic vegan chocolate cake and our best vegan chocolate cake recipes, with oreos baked into the layers. 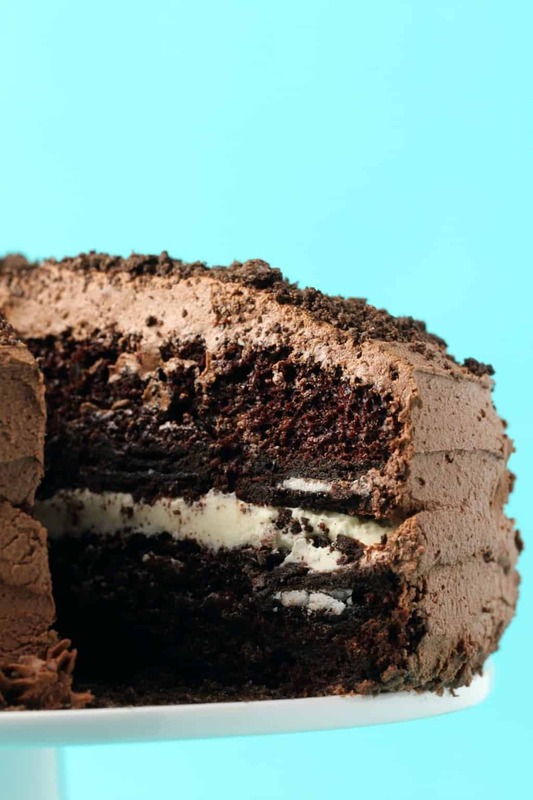 To bake the oreos into the layers, you just line the bottoms of your 9-inch cake pans with oreos and then pour in your chocolate cake batter. Then you make a simple vegan vanilla frosting for the center and a delicious vegan chocolate buttercream to frost the tops and sides. Just like a giant oreo. And of course, you decorate the cake with crushed oroes. The vegan chocolate buttercream makes quite a lot, it’s enough to do some piping extras if you want to do that and frost the top and sides quite liberally. As you can see in the photos, I added some little piping detail at the base of the cake. So there is enough to do that if you want to. 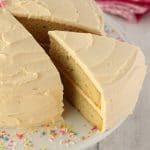 The vanilla frosting makes enough for a lovely thick layer of creamy white frosting in the center which looks super cute. 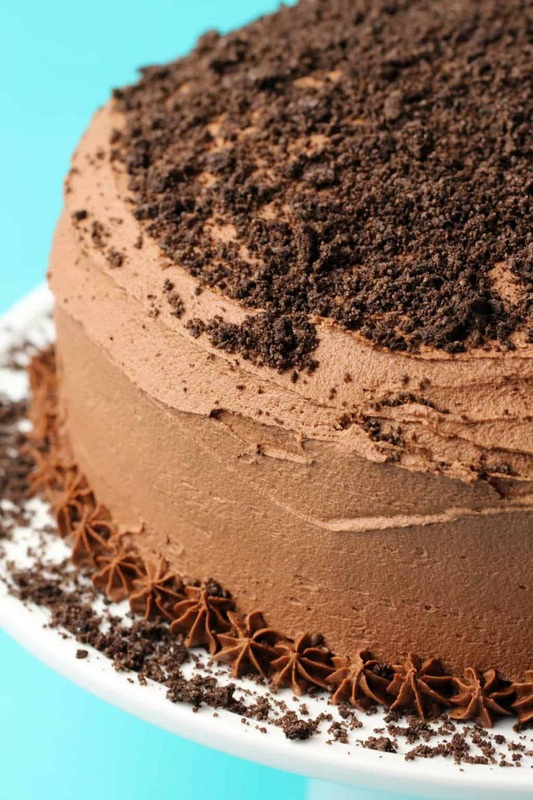 If you want to make this vegan oreo cake even easier and aren’t a massive fan of frosting, you could omit the vanilla frosting center and just use the chocolate buttercream for the whole cake, it would just be a thinner layer of it. 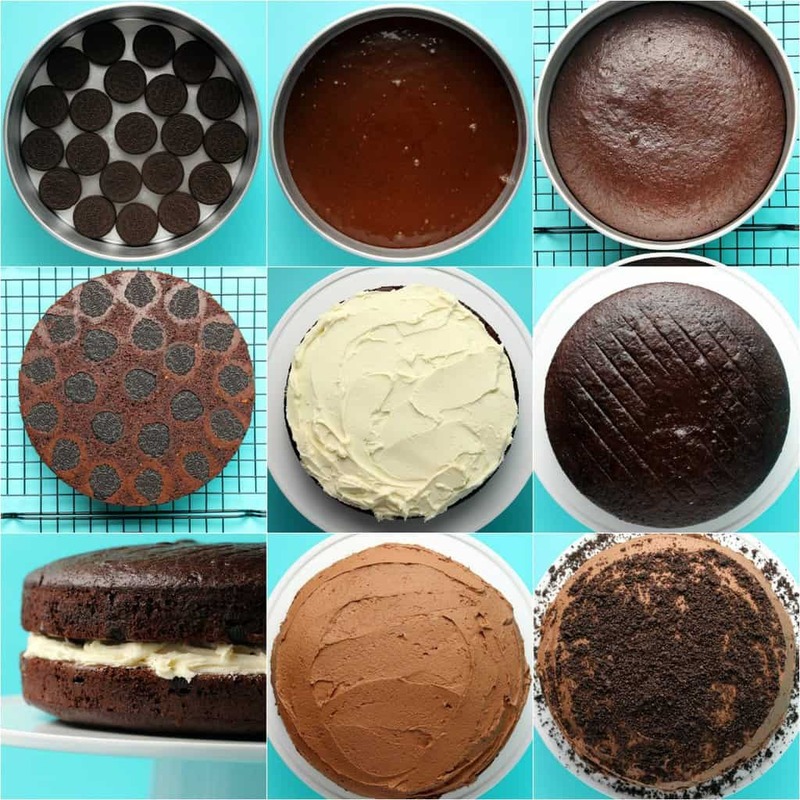 Keep your leftover cake covered and stored in the fridge for up to 3 days. Usually cakes would last a bit longer in the fridge, but this has to do with the oreo cookies, they’re at their best when consumed within 3 days of making the cake or they can start to get a little soggy. 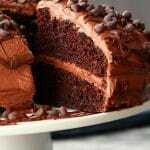 You want that lovely crisp cookie texture contrasting with the moist fluffiness of the chocolate cake. Yes they are. Their ingredient list is vegan. 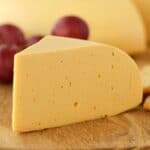 However, they are made in a factory that also processes non-vegan (dairy) items so if you have a serious dairy allergy, probably not for you as the possibility of cross contamination exists. But this is similar to the possibility of cross contamination if you eat a vegan meal at a non-vegan restaurant. The possibility of cross contamination does not mean that the ingredient is IN the food, it means that if you have a serious life threatening allergy you should probably avoid it. Read the ingredients list though as they might not be the same in every country. If you are not an oreo fan you can use a different kind of vegan sandwich cookie to make this cake. 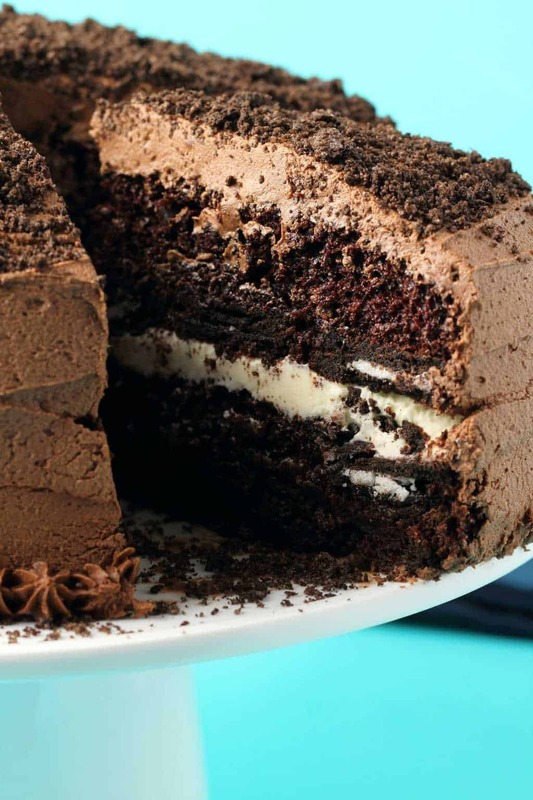 You will love this vegan oreo cake! It’s like a giant oreo cookie. It really is. It tastes like it and looks like it too! Mega-chocolatey. It’s two layers of decadently delicious chocolate cake with chocolate oreos baked into it and a frosting of chocolate buttercream. It’s a chocolate lovers dream. Perfectly contrasted textures between cake, cookies and frosting. Seriously! 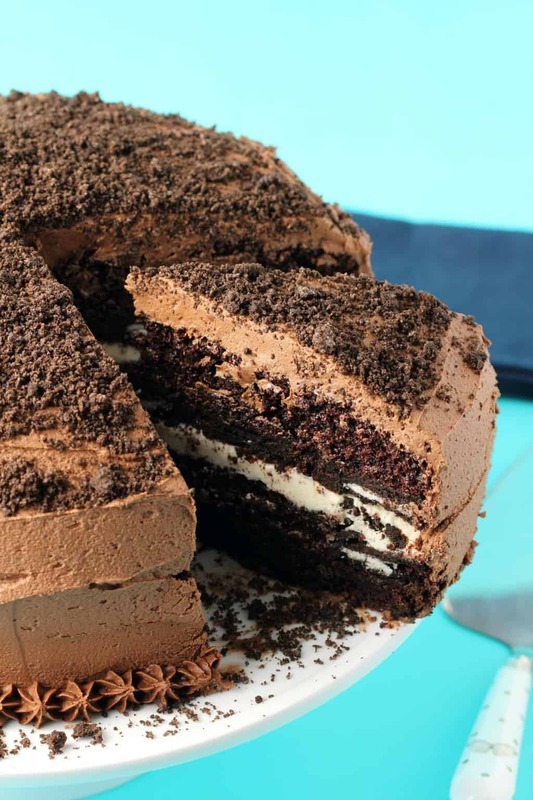 You have this wonderfully moist, light, spongey cake, crisp baked oreo cookies, creamy vanilla frosting and silky smooth, creamy chocolate buttercream. It’s super easy! No really, it is. No fancy ingredients in this, it’s stuff you’ve likely already got in your pantry. It’s decadent as all heck! Seriously, you don’t even want to know the nutritional info for this cake. When doing the calculations here I suddenly understood why so many baking bloggers omit this info! But you know it’s going to be just soooo good! 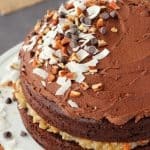 Want more vegan chocolate cakes? Let us know in the comments what you think of this vegan oreo cake and please rate the recipe too! Thanks! Sign up to our email list and we’ll send you a gorgeous vegan dinner recipes ebook containing 10 delicious recipes and you’ll be the first to know when new recipes are posted to the blog. This vegan oreo cake looks like a giant oreo cookie! 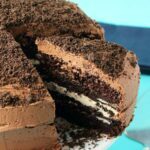 Oreo cookies are baked into the chocolate cake layers and it has a creamy vanilla center and vegan chocolate buttercream frosting. Spray two 9-inch cake pans with non-stick spray and line the bottoms with circles of parchment paper. Then place oreo cookies along the bottom of the pans. I used 21 cookies in each pan. Set aside. Sift the flour and cocoa powder into a mixing bowl and then add the sugar, baking soda and salt and mix together. 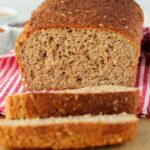 Prepare your flax egg by mixing 1 and 1/2 Tbsp ground flaxseed meal with 4 and 1/2 Tbsp hot water from the kettle and leave it for a minute to become gloopy. Add in the soy milk, vanilla, oil, vinegar and flax eggs to the mixing bowl and mix in. Use a hand whisk briefly just to remove any lumps. Divide the batter evenly between the cake pans, pouring it over the oreo cookies at the base of the cake pans and quickly smoothing it down so that it properly covers the oreo cookies. The layer of batter is quite thin so you want to smooth it out to the edges of the pan so that the oreos are all covered. Bake in the oven for 30 minutes or until a toothpick inserted into the center of one of the cakes comes out clean. Let the cakes cool for a few minutes and then remove them from the cake pans and place onto a wire cooling rack to cool completely before frosting. 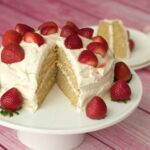 While the cakes are baking, prepare your vanilla frosting center by adding the vegan butter, powdered sugar, soy milk and vanilla extract t to the bowl of a stand mixer and starting off at slow speed, gradually increase speed until thick and smooth. See my notes below about the soy milk, you might not need all of it, though I used it all. Set aside. Prepare your vegan chocolate buttercream frosting. Add the vegan butter, powdered sugar, cocoa powder, soy milk and vanilla to the bowl of the stand mixer and starting at slow speed, gradually increase speed until thick and smooth. If your ingredients are threatening to jump out of the bowl when you start (if you have a small bowl for your mixer) then hold a tea towel over the bowl when it starts mixing. See the note about soy milk for the frosting in the notes below, it’s possible you may not need to use all the soy milk, though I used the full amount. Place one of the cake layers, oreo cookie side up, on a cake stand. Add all the vanilla frosting and smooth it evenly over the cake into a thick layer. Then place the second cake layer, oreo cookie side down, on top of it. 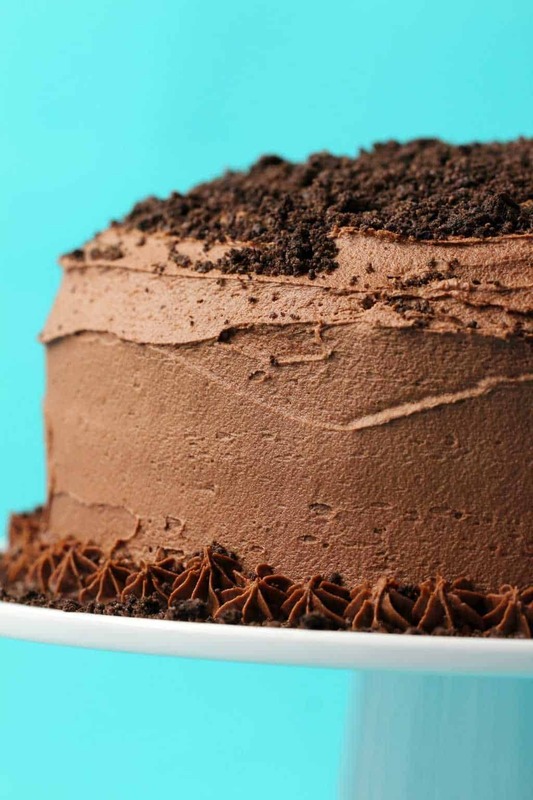 Frost the tops and sides of the cake with the chocolate buttercream. You can put it on thickly and there will still be a little left over for some piping detail if you want to add that. Crush up the 6 oreos and decorate the cake with the cookie crumbles. *You can use almond milk instead of soy milk. *You can use any vegetable oil instead of extra virgin olive oil. *You can use apple cider vinegar instead of white vinegar. 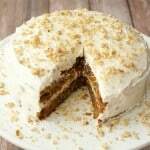 *When adding the soy milk to the frosting recipes, go slow. Some brands of vegan butter have a higher water content than others, it’s possible you may not need to use all the soy milk recommended. This is how much I used but different brands of vegan butter can have differences in their water content. 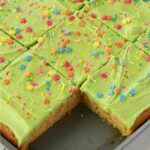 *This recipe has been updated, my original recipe did not use parchment paper along the bottoms of the pans, but we re-tested it and found it works great with parchment paper along the bottoms and lets the cakes come out really easily, with no impact on the crispiness of the cookies baked into the cake bases. 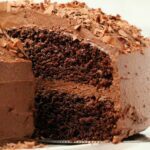 Awesome, chocolatey, moist and oh so decadent! I’m going to make this for my daughter’s birthday. It looks amazing! How is it cutting into the cake? I’m wondering if mini Oreo cookies would make the cake cutting easier? Thanks for the quick response, Alison. I just finished making this decadent cake and used regular-sized Oreo cookies. Have to wait several more hours before we can eat it, though! It looks so delicious!! I can’t find vegan butter in Namibia. Could I use margarine instead or can I use the butter that you make, will that be ok for this? Thanks a mill! Love your recipes! I made this cake for my daughter’s birthday. It’s so good!!!! I did have a bit of trouble getting the cakes to release from the pans. I ended up having to slam them upside down on the counter to get them out. Some of the oreos stuck, but I was able to scrape them out and get everything pieced back together! I will definitely make this cake again but will use parchment paper next time since the oil didn’t do the job. Hi! Can’t wait to try this recipe. But I was wondering, is there any other alternative to flaxseed? Thank you very much.